Two young brothers throw a tantrum when they discover that their father isn't the most important man in his workplace. A married Tokyo man faces unemployment after standing up for an older colleague. A widow sends her only son away to receive a better education. Years later, she visits him, finding him a poor school teacher with a wife and son. Shuhei Horikawa, a poor schoolteacher, struggles to raise his son Ryohei by himself, despite neither money nor prospects. A kabuki actor's mistress hatches a jealous plot to bring down her lover's son. A businessman clashes with his elder daughter over her choice of a husband. An aging widower arranges a marriage for his only daughter. A man returns from World War II to find his desperate wife had resorted to one night of prostitution to pay for their son's hospital bills. Unemployed Kihachi and his two sons struggle to make ends meet. But that doesn't keep Kihachi from wooing single mother Otaka. Several days ago I saw a perfect print provided to the PFA by the Japan Foundation, with benshi Midori Sawato accompanying. 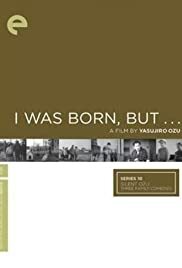 The performance, of course, was exquisite, if sedate in keeping with the film and Ozu's reputation. Whether by chance or ingenuity the PFA placed Sawato on a raised platform, so you couldn't look at her face without also seeing the film, or the film without seeing her. Her male intonations, though with at least no obvious satire, rival those of Laurie Anderson or Lily Tomlin. But I've been wondering what on earth to say about Ozu. He hadn't discovered yet his low camera angle, and the pacing's not quite as slow as it would become. I'm afraid all that's stayed with me that anyone else might not say, is that, perhaps oddly for a film about a typical family of four, Ozu's camera again and again frames groups of three. I can't remember whether he does this later. Maybe Ozu just liked an image size that makes three optimum. Already, without the formality to come, his frame was beginning to solidify. Don't know. Something to think about is all.